This revised edition celebrates the 10th anniversary of the author’s first published novel. When you lose a loved one, whether it’s a relative, friend, or precious pet, you wonder where that special soul has gone and if you will ever see him or her again. For Dulcie Mills, Long Island computer programmer, the answer may lie between a virtual world and the real one, between the past and the present, between dreams and reality. Unable to get over her fiancee’s death and facing the impending loss of her 15-year-old cat, Dulcie escapes to a virtual world. When Dulcie’s best friend accepts a job from a clairvoyant who offers predictions regarding Dulcie’s dead fiancée and Dulcie becomes attracted to an online stranger, history begins to repeat itself in ways that are both promising and terrifying. What Dulcie discovers through a virtual séance may mean the only chance she has left for love or death itself. Addressing topics of reincarnation and soul transfer in similar ways as Greg Iles’ Sleep No More and Nora Roberts’ Midnight Bayou, Cloudy Rainbow features an interesting mix of technology and the paranormal and will also appeal to cat lovers. 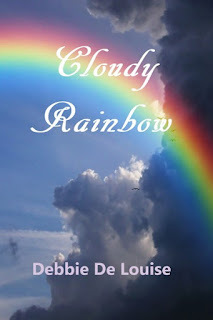 My first novel, a paranormal romance, "Cloudy Rainbow" (Booklocker 2008) received an honorable mention in the Writer's Digest self-published awards. 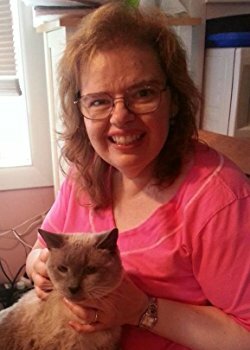 I wrote that book after my beloved cat, Floppy, died from diabetic and liver complications. The book is dedicated to him, and he is featured as a character in it. Thanks so much for hosting a spot on my book tour.